For the past few weeks every time I sit down to write a new post I can't think where to start, what words to use, what to say. I realized part of the problem is my life and mood right now do not match a lovely dinner centered around Deborah Krasner's recipe for Roasted Cardamom, Oregano, and Garlic Chicken Thighs. That chicken recipe won the right to be published here, however for at least a little longer it will have to wait. This blog is more than the food I feed to my family, it is also about the stories we make every day around the food we eat. So I am going to post that recipe when the time is right. When it fits back into the story of my life. My life is preparing for change in the coming months and for dinner I have been looking for comfort at the table and ease in the kitchen. I have to admit I also wanted no whining from the short gourmands. When I say I wanted ease in the kitchen, I really mean I had no interest in making dinner. But somehow saying, there is nothing for dinner tonight time for bed, never seems to go well. So the other night I made waffles for dinner. I know many of you are now questioning my sanity. You are picturing many bowls, separating the eggs, beating the egg whites and shaking your head as you wonder why I would prepare waffles when I didn't want to cook. However the beauty of these waffles, besides from how they taste, is they are an easy cheaters way out of the kitchen. If you mix the wet ingredients in your glass mixing cup they only use one bowl. I still love my Sour Milk Butternut Squash Waffles but they are much more work and frankly taste better when made by my friend Tavi. To feel more like I was giving my children a balanced dinner I prepared macerated strawberries to serve with them. Which is a fancy way to say I took strawberries, sliced them and sprinkled them with sugar; after a few minutes the strawberries release some of their juice and become a perfect waffle topping. This simple preparation and the end result is most impressive if you tasted the berries I used before macerating. Usually I stay away from strawberries this time of year. However I have been shopping at Costco to buy fruit for the preschool food program I am establishing. I feel like a bad mother buying blueberries, melon, mangoes and kiwi for other peoples children and then going home and telling my children just to eat another storage apple. So this last week I bought strawberries the size of my head and fed them to my children. The one I tried tasted like cardboard, although a special variety of cardboard that has less flavor then usual. These waffles are based on Art Smith's sour cream waffles from Back to the Table: The Reunion of Food and Family . I found the recipe on 101 cookbooks and have been tweaking the recipe for several years now. I played with the type of flour, sometimes I sub some of the butter and sour cream for butternut squash puree and I simplified the technique. When prepared with the butternut squash puree they are even better when frozen and then reheated in the toaster. The squash puree makes them moister and softer so the final heating crisps them up. They are a little soft when fresh from the waffle iron made with squash but when served with macerated strawberries nobody at the table will complain. The first time I used spelt in these waffles it was also in response to dinner time guilt. I was feeling like if I was going to make waffles for dinner I should try to make them as healthy as possible. However to my happy surprise everyone prefers them with the addition of spelt flour. 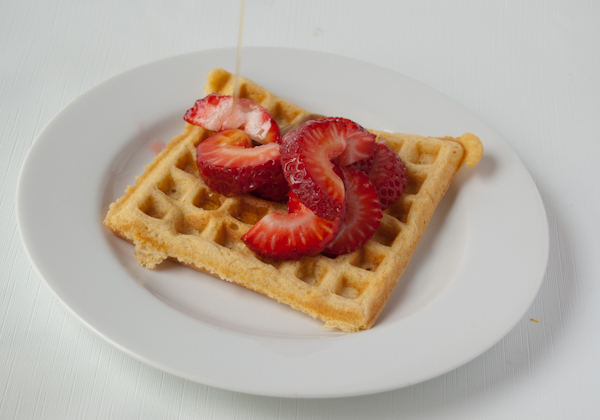 Spelt adds a sweet nutty flavor and a pleasant texture to the waffles. However if you do not want to buy one more flour, these waffles will still be wonderful made with half white and half whole wheat flour. Begin heating your waffle iron as you prepare the waffle batter. Combine the flours, sugar, baking powder and salt together in a large mixing bowl. Measure the milk in a large glass mixing cup and add the sour cream or Greek yogurt, eggs and extracts to the milk. Whisk the wet ingredients with a fork or by holding the handle of the whisk between your palms and rubbing your hands back and forth to spin the whisk. Make a well in the center of the dry ingredients and pour the wet ingredients into the well. Whisk briefly to start to incorporate the wet into the dry ingredients before adding the melted butter. Mix the batter until it is all incorporated and smooth. Do not mix any longer once it is smooth, over mixing can toughen the waffles. Spray the waffle iron grids with cooking spray and ladle batter into the center of the iron. A trick I finally figured out not to have waffle batter overflow out of the iron while baking is not to worry about making perfect waffles which are filled all the way to the edges. If you slightly underfill the waffle grids it won't drip out. I know this isn't rocket science, and yet for me it really was ground breaking. If you aren't as gluttonous it may not be an issue. 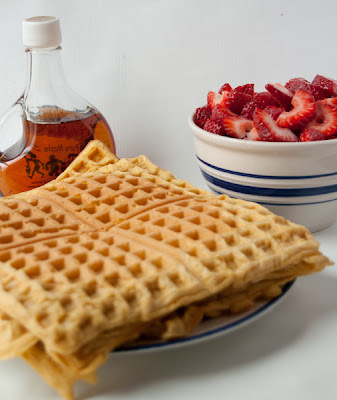 Cook until the waffles are golden brown to your liking and serve hot, with macerated strawberries, maple syrup or the topping of your choice. Begin heating your waffle iron as you prepare the waffle batter. Combine the flours, sugar, baking powder and salt together in a large mixing bowl. Measure the milk in a large glass mixing cup and add the sour cream or Greek yogurt, butternut squash puree, eggs and extracts to the milk. Whisk the wet ingredients with a fork or by holding the handle of the whisk between your palms and rubbing your hands back and forth to spin the whisk. To freeze: separate waffles into individual waffles and place on a cookie sheet in the freezer until frozen. Once frozen place in a zip lock bag in the freezer. Toast waffles from frozen to serve. Waffles for dinner are a FAVORITE! Yay for BFD (Breakfast For Dinner)!